The neighborhood around Mott Street in 1800 was had little to offer. The 48-acre Collect Pond, once a bucolic picnic spot was now a dumping ground for the waste from nearby tanneries, breweries and slaughterhouses; creating in effect an open, rancid sewer. Yet it was here that a group of English Lutherans opted to build their new church. The group had broken away from its downtown congregation which conducted services only in German. Costing $15,000 and completed in 1801, the English Lutheran Church Zion was a Georgian-Gothic field stone structure with handsome stone framing around the window and door openings. Within six years the congregation had broken away from the Lutheran church entirely, converting to Episcopalian. On August 31, 1815 a catastrophic fire swept through the area, destroying 35 homes and essentially gutting the church. The attempts to rebuild made by the rector, Rev. Ralph Willston, were so financially crippling that he was forced to resign in 1817 and the property was sold under foreclosure at public auction at the Tontine Coffee House on Wall Street. 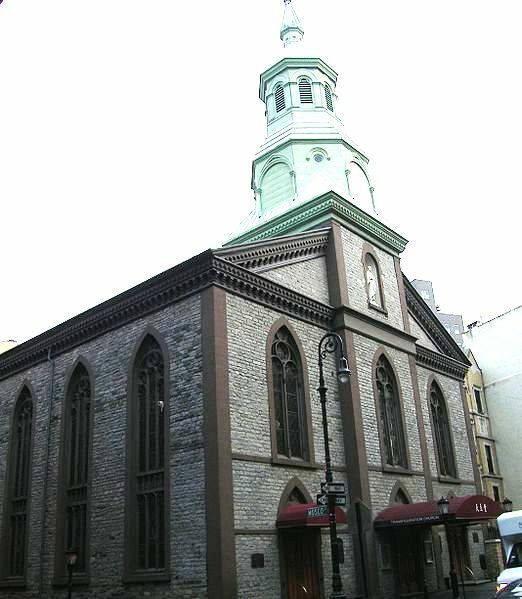 Peter Lorillard purchased the building and reassured the concerned parishioners that he “would retain the property until some friends of the church would stipulate to finish rebuilding, and then restore it to its former ecclesiastical organization.” Six congregants stepped up with sizable donations, aided by a $10,000 loan from Trinity Church. The renovated structure was completed in 1818, dedicated by Bishop Hobart on November 16. 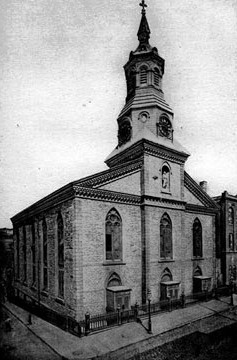 The Roman Catholic Diocese of New York purchased the building for the Parish of the Transfiguration. The Cuban-born founder of the parish, Father Felix Varela, died that same year, after which the church was led by a succession of Irish, then Italian, pastors throughout the 19th Century who worked with the poor Irish residents of the area. By the 1890s more and more Italian immigrants were settling in the Five Points area. 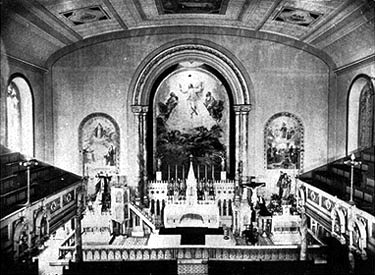 The Irish leaders of the parish refused to allow them to worship in the main sanctuary; forcing them to hold services in the basement. Finally in 1902 when Rev. Ernest Coppo became pastor, the Italians were allowed upstairs. In the meantime, however, the Chinese were now infiltrating the neighborhood in large numbers. In response, the Rev. Dr. McLoughlin of Transfiguration spoke before the Board of Local Improvements of the Tenth District in March 1899. Explaining that he was the guardian of over 5,000 souls, “mainly English-speaking and Italians,” he rallied for the removal of “the Orientals” to another quarter. McLoughlin’s intolerant rants did not produce his desired outcome and not only did the Chinese stay in the neighbor, within a few years the Salesian Society took over the staffing of Transfiguration. An Italian issionary society, the Salesians immediately sought ways to include the Chinese into the parish. Before long a Chinese-speaking pastor who had done missionary work in China was brought in to help. By the 1940s the Maryknoll Fathers, respected for their missionary work in China, managed the church and a Chinese school was established. April 24th 1802 my 5x Great Grandparents were married here: Willem Girodet [William Gerodet, Gerrodette] and Jemima Brower. William a French immigrant, Jemima descended from the Brouwer family that were among the early settlers of New Amsterdam, as well as from Sarah Rapelje, the first Christian child born in the New Netherlands.